An invitation to all Christians around the world who want to start the New Year with extended prayer and fasting using the Daniel Fast. Good morning to you, this is been a wonderful opportunity for me to be encouraged to meet my family and my church family in a spiritual movement. I’m asking God’s help in this fast for my family and for my church family; not out of obligation, but out of an internal desire to get to know the Lord more deeply. And that others both my family friends and others will get to know the Lord God Almighty more deeply as well. My husband and I are excited to be doing this 21day fast for the first time. We are excited! I enjoyed the video! It was so inspirational! 2 GOD BE THE GLORY!!!!!! IN JESUS NAME AMEN.FOR .AND GOD FOR THE DANIEL FAST. I am a Christian has been for years and has never tried the Daniel fast. I’m looking forward to trying it. So that i can hear more, learn more and be who the father would have me be. I have read and watch the video and it has truly been a help. Don’t know if I can start off 21 days but i will do seven and grow. Thanks for the help of learning me the importance about the fast and how helpful and powerful it will be to me. it’s so humbling to read how blessed people are after their first fasting experience. I fast regularly and reading these post made me realise that I have stopped enjoying Gods presence during my fasts, but I have turned it into a chore. some of the posts brought tears to my eyes. thank you Jesus for reminding me that it’s not by power or might but by the spirit of the Lord. The Daniel Fast is totally plant-based, so eggs are not allowed on the fast. I hope this helps! Eggs are allowed or no? Oh, thank you so much! I was reading the nutritional list instead of the ingredients list. Since you are quoting grams, it leads me to believe that you may be reading the Nutritional list and not the Ingredients list. For the purpose of finding approved foods, you’ll want to only read the Ingredients list to find what is in the product. If sugar has been Added in this is where it will show (otherwise the sugar is naturally derived and allowed). I hope this helps! I have been shopping for hours trying to find canned and frozen vegetables without any sugar. All of them have 1, 2 or 3 grams. Is it OK to use them. I’m so happy to have found this site! I am starting my 40 day Daniel fast tomorrow 22 April 2014.I feel something is missing in my life and I need direction, breakthrough and forgiveness. All glory be to God! Lyle, God led me to start the Daniel Diet Fast even before I ever heard of this movie. Guess I’m in sync with what others are doing. Good to know you are hearing from God. My wife and I begin our 21 day fast monday. Thank you for enlightening and encouraging me, I am truely looking forward to it. I have just gone though the epilepsy monitoring unit when and old friend came by to see me…. two days in a row. Somewhere amidst our conversations she mentioned the Daniel Fast. I listened but then when I got home something about it “whispered” to me to take a closer look at it. Um primarily a vegan but have my weaknesses particularly when it comes to coffee & sugar. What a wonderful opportunity to fast. While I am approaching Lent ~ beginning next Wednesday I’ve never really been in tuned with fasting, as it should be practiced. All the sudden this opportunity came knocking, particularly at this time when I’ve had a hard diagnosis in my health & need more spiritual uplifting and healing for God to show me what to next, because I do not know. I will start Ash Wednesday. This friend I mine I must note, I hadn’t seen I years, but she same and sat by me despite her busy life. I know this was a tap on the shoulder. I started the Daniel Fast 2/8/2014, I am so blessed to have followed direction! Andrella, God will most certainly se you through your fast.. My wife and I are starting our fast this coming Monday. I know I wil have questions throughout my 21 days, but I know Go will see me through. I will definitely keep you in prayer. He is definitely good, Susan. 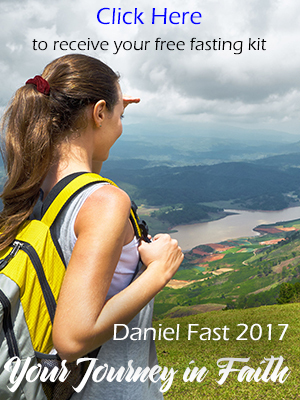 I will be purchasing your book, “The Daniel Fast” today through Amazon Kindle. I definitely want to be prepared going into my fast on Monday. I’m sure I will have questions along the way, but I know that these next 21 days starting on Monday will be a life changing expeience for me as well as my wife. Praise God, Jeff! He is so good. Thank you for posting this message and the account of your experience at the Columbia Mall. We live in challenging times. More and more reason to stay close to the Lord and to seek Him with our whole hearts. My wife and I will begin our 21 day fast this coming Monday, February 3rd. We were involved in the Columbia Mall shooting in Maryland this past Saturday and I know it was nothing but God that spared our lives because my family and I were right next door to where the shooting occurred. We were interviewed and on television this past Monday night telling everyone how God saved my family from that traumatizing event. We needed to get the word out that God had everything to do with getting us out of there, from me praying for protection even before we arrived at the mall and for our family staying together even when they wanted to separate and go their separate ways. God put in my spirit to pray for protection and to keep us together. He even had angels in human form get us out of there safe and sound. I truly believe that without a shadow of a doubt. So, I know God has a purpose for my life and I want to seek direction from Him. I need to hear His voice. To God Be The Glory!!! Thank you Janie, for your kind words and sharing this awesome testimony! Be Blessed as you continue to grow in the love and grace of our Lord Jesus Christ! That was an awesome video! I felt the spirituality and I feel the energy, inspiration and motivation to move forward with my journey. I want to take this opportunity to thank you, Susan, for being such an inspiration and a blessing to all of us through your encouraging words by emails and by all your wonderful books you have written. I have completed my 21 day Daniel Fast and I want to give praise to the Lord Jesus Christ for giving me the strength. I also want to thank Him for answering my prayers, in that one of my daughters, now has a permanent full time position and my other daughter got a better job which is closer to her home. Thank you Jesus. Amen. Thank you for your encouraging post. Be Blessed! Spiritual and uplifting video that encourages us to stay the course that God is leading through this fast. That’s awesome. He will see you through. I begin my fast Jan. 27th. I will keep you in prayer. That’s the great thing about prayer, you don’t have to know everyone’s name but you can uphold everyone in prayer and God doesn’t get confused. I have begun my 21 day fast 2day. Going threw many situations; still I remain strong nd trust my God to get me through them with victory. I’m 27 yrs old single mom of 3 sons nd I love the Lord nd I’m depending on him for everything. I need his direction nd peace. To God be the Glory. Is anybody doing the 40 day fast during lent? My sister and I are doing it. Hope more people join us. This is my first time to do the Daniel fast and it has been a wonderful encounter with my Jesus. He has provided me strength, provision, joy, love, and peace. Thank u Jesus for sending your Holy Spirit to be my comforter , teacher, and guide. I love you Jesus please continue to teach, speak, give me direction and order through the rest of the fast. In Jesus name Amen! This video is a great motivation for me. I’m going into my 2nd week now and I know I need to rely on the strength that only God can give me. An inspiring video! I am 4 days into my own Daniel Fast and encouraged that I have brothers and sisters all over the world who are joining me in a quest to travel deeper into the heart of God. What a wonderful video it brought me to tears and prayer for my family to be able to view this video so they may share the Daniel Fast with me and others .God bless you and your family.